*Illinois can’t seem to produce a solid politician to save their lives. Ever since their governor Rod Blagojevich tried to sell Barack Obama’s seat to the highest bidder things just have not been the same. Now the democratic candidate for Lt. 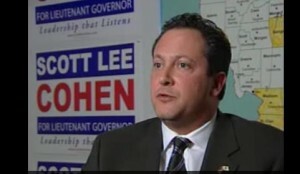 Governor, Scott Lee Cohen, is on the hot seat. He was running and crying all the way to the exit when his past showed up to greet his public before him. Cohen had a whole slew of battered women fell out of his closet. The ex-girlfriend, the ex-wife, a clown from his son’s last birthday party (okay that one isn’t true) and then as a small consolation for him the media throws in the fact that the ex-girlfriend was a prostitute. What the hell? That doesn’t matter when you’re already in trouble. That trumps the loss! They not only got him for being a member of the Beatchix tribe, but then he admits to taking steroids. For what? He’s as bad as Sarah Palin and the pregnant teenage daughter falling out of her closet. Why do people show up on the campaign trail dragging so many bones behind them? Read here for the rest of Illinois governmental mess. Next ArticleBeyonce’ Caught Up In RICO Sting?